In this issue of the Village, you will find information related to: Residents Input Sought, HARIBO of America, Parcel 32, E-Newsletter, Breeze Terrace, TID #7, Commendations, Roger Mayer, Vehicle Parking, Pleasant Prairie Triathlon, Road Closures, Mini Maker Faire, Camera Partnership, Levy Limits, Nixle, Board and Commissions Openings, Historical Society. 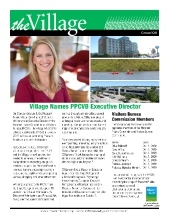 In this issue of the Village, you will find information related to: Aurora Health Care, Dark Store Legislation, Rocket Wash, RecPlex Emergency Shelter, The Gateway, Police Association, Residential Recycling Center, Who to Call during a Public Works Emergency, Iron Girl Road Closures, Bike Trail Agreement, Chest Compression Devices, Partisan Primary. In this issue of the Village, you will find information related to: We Energies Power Plant, Aurora Health Care, TID #7, Eva Manor, Wisconsin Marathon, Parks Commission Meeting, Shred Event, Pet Waste, Safety Tips, Elected Village Officials, Firefighter Recruit Graduation, Photo Contest, Nash Polar Plunge, Retirement, RecPlex Summer Camp, Awareness Campaign, Ash Tree Replacement, Historical Society.